I stopped by Baldwin Beach outside Pa'ia on a late January afternoon and was intrigued by this young couple contemplating each other's faces. I felt a bit surreptitious taking a photo of them, but I loved their expression and body language. BTW, this blog post is linked to a "Water" Photo Challenge this week. The far left side of Baldwin Beach towards Kahului. Ironwood tree skeleton near the water. Baldwin is one of the best beaches on the North Shore with a classic sandy shoreline and waves. To the far left is Baby Beach, a protected cove which got its name from young mothers who brought their infants to play in the calm waters. Sunset glow at Baldwin Beach. Handy dandy restrooms and showers. Far right side of Baldwin Beach, another protected cove with hippies, young people, and swimmers who like the shallow waters. If you keep walking to the right, it runs into Pa'ia Beach. Inland but still on the beach, there's an old derelict building that the county is going to tear down. Ironwood trees are in the background. Parking area toward the lifeguard stand. There must have been lots of rain, since it's all flooded. Warning: this place can be a bit funky after sunset, so please don't hang out at night. I know people who've camped on this beach and had their tent ransacked. Actually, camping here isn't even allowed. All in all, though, this is a gem of a beach. Two disparate topics, but somehow they are entwined in my brain. Just warning you, this is a stream of consciousness post. Original photo courtesy of Flickr Creative Commons. Cradle to Cradle Technology is the opposite of Cradle to Grave, which is the current state of consumer products in the world. Items are bought, used, then trashed, and rarely salvaged or reused. Aluminum is one exception according to leading sustainable architect William McDonough, who says 75% of aluminum in circulation has been recycled. Certain components or materials like lead can be recaptured as “technical nutrients” so that they are not released into the environment. Plastic polymers can be developed so that they disintegrate in sunlight or in salt water, and become food for bacteria. McDonough is already talking about phosphate production that can be extracted from local sewage plants, as a natural byproduct, since phosphate crystals naturally form and clog up sewer pipes. Phosphate extraction is already happening in Canada and being put in place for cities like Portland and San Francisco. Why phosphate? It’s a necessary ingredient in fertilizer, and a needed daily nutrient for human beings. If we can’t produce phosphate, then we’d need to obtain it from long distances and perhaps politically unstable countries. McDonough is working with chemists and industrial designers to create processes that mimic nature’s cycle of renewal. He’s currently working on a house that can be built without tools, even by small children. For Hawaii, I’d love to see beach umbrellas that disintegrate on their own. It’s amazing how many beach umbrellas and beach chairs are trashed because one little piece has broken off. Or they are trashed when they are still perfectly usable. Beach mats are kind of compostable since they are made of grass, and I’ve thrown several in our compost pile, but the nylon or polyester threads do not break down in the compost. How about beach umbrella cloth that also disintegrates in sunlight or sea water over time, and can become food for sea creatures? How about beach mats sewn with natural thread fibers or of polymer fibers that do break down? Or Styrofoam coolers that break down in salt water? Body boards that also naturally disintegrate over time? What if it could be recycled, or if the fibers and post decomposed naturally? What about sunscreen that doesn’t clog the coral reefs? Many local hotels and resorts have to thoroughly clean their pools at least once a week, because of the thick oil slick from sunscreen. This same sunscreen blankets the beaches of Ka'anapali and also kills coral. Will Hawaii have coral reefs 30 years from now? Not if we keep using the same sunscreen in the vast quantities that we use now. And what does cradle to cradle technology have to do with industrial hemp production? Two nights ago, Colorado farmer Michael Bowman gave a talk at the Maui Farmers Union about industrial hemp production, meaning the farming of hemp. Hemp - not cannabis, not marijuana, not pot, not Maui Wowie, nothing to do with THC, the active ingredient in marijuana. Hemp as a plant fiber used in rope, fabric and other industrial uses. Bowman said that the US is the only nation which uses industrial hemp but is not allowed to grow industrial hemp. The US imports it from Canada and other countries because of federal drug laws designed to prevent marijuana use and growth. Currently, industrial hemp farming is exceedingly difficult. A shed in the field that has internet access and can store the seeds, which need to be locked up at all times. Bowman briefly went over the history of hemp production in the US, including the key industrial figures (Rockefeller, Hearst, etc…) who taxed hemp and helped make it illegal because it would compete with the newly emerging paper and oil industries. Colorado just passed a law that legalizes farming of industrial hemp and Bowman wants to be one of the pioneer farmers. He thinks legalizing farming of industrial hemp would bring many jobs back to the United States. Hemp inherently seems like a cradle to cradle fit. As a material, it can be used to make biodiesel and can even be used as a concrete substitute. Per Bowman, hempcrete is three times stronger than cement or concrete, yet lighter, and homes are being built with it now. Michael Bowman has also gone to Capitol Hill to lobby for the legalization of hemp cultivation and talked with President Obama and Secretary of Agriculture Vilsack. He is now pushing a hemp farming petition on the White House website. The White House says that anytime they get 100,000 signatures on a petition, they will offer a policy response. What's gratifying to hear is that Bowman said that his group has been working to legalize hemp farming in Colorado for five years, meeting lawmakers from both parties, and anyone who was interested. So sometimes all those petitions and sustainability efforts make a difference. What if hemp could be used in beach umbrella fabric or in beach chairs? What if hemp could be processed to make foam coolers that disintegrate? What if Maui’s sugar cane fields could be turned into hemp fields? What about Hawaii homes made from hempcrete, that are resistant to mold and mildew? Hmmm, is hempcrete termite-resistant? 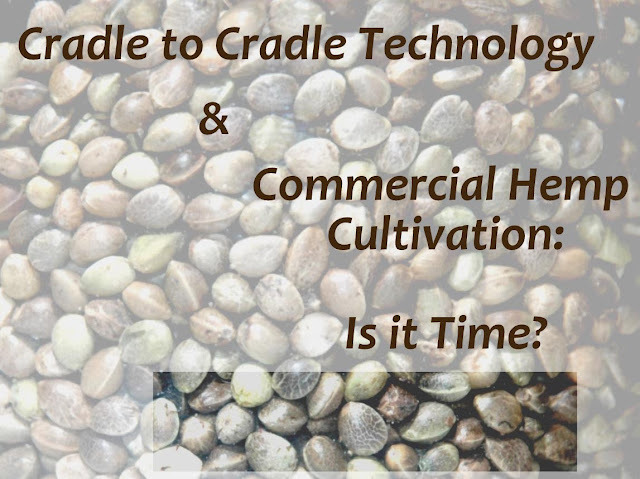 What are the possibilities for cradle to cradle technology using locally grown hemp? A lot of people think of Maui as an idyllic paradise, with mai tais on the beach, cute surfers, and perfect weather, a place where nothing bad ever happens. But Maui is a real place on a real planet, and sh*t happens from time to time. This is not a post telling you to go to TEDxMaui. This is for you to decide. In fact, I’m probably the last person to tell anyone to go or not go, because I didn’t go last year. I spent the day (actually several days) diving into my mom’s boxes of paperwork, sorting out bills, receipts, and financial documents while she was in the hospital. But I listened to the TEDxMaui livestream because I still wanted to be part of the historic event, the first TEDx conference on the island. Listening to a live stream is not the same as being there surrounded by all that energy. There’s something called morphic resonance, a concept coined by Rupert Sheldrake… and one of his ideas is that when there’s a large group of people, say at least 400, there’s a field of energy created by having all those people in the same space. If you’ve been to a live rock concert with hundreds of people, you may know what I’m talking about. It’s not the same as listening to a cd at home. Having a lot of people, 1200 or so, at a TEDxMaui event and being in this energy field of ideas to transform society, could be a way to transform society at a telepathic level. Aside from that, the speaker line up is very interesting. But I won’t tell you to go. In fact, I will be missing it again this year because I have a schedule conflict on Sunday morning – would you believe, the community garden annual members meeting? And sure, I could skip it, but I think it’s important for me to go, because the garden is as much about building community as an event like TEDx. So, I’ll miss out on whatever fascinating conversations or interactions there may be. I’ll hopefully get a chance to watch the speakers on video later on and maybe listen to the live stream (if there is one) later that day. It’s about choices. We all have to make them, based on time, money and other values. If you have free time on Sunday and want to soak in the energy field of TEDxMaui, socialize, and get a brain work out, go for it. If you’re new to the island, this would be a great way to get to know some of the movers and shakers. In fact, I encouraged some newbies to Maui, who’ve only been here five months, to go. They are starting a new business and it could be a good networking opportunity. 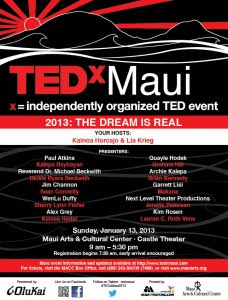 On the other hand, I cannot claim that going to TEDxMaui will change your life or make you a better person. I think a lot depends on what you do with the information. I've gone to a lot of workshops - and the trick is applying the knowledge in my daily life. If you think you might be overwhelmed by the possibility of 1200 other people in the same space, then it’s probably not for you. If you can’t spare time or money, because of whatever else is going on in your life, then it’s not for you. January is a busy time for a lot of us here on Maui. It’s high tourist season which means a lot of us are working extra hours as well. But I also think that’s why the event organizers scheduled it at this time, because there's more people on island. If you go, have fun! If not, I would never give you a guilt trip. And I'll still try to go next year (knock on wood). Ho'okipa bluff visible from Hana Highway. A grinning skull. Hmm... the artist has a macabre sense of humor. The rainbow in the background. birthday wish a couple of weeks later. click on the label in the right column for "public art."